Today I found out how to make a cheap analog pressure sensor. Tired of paying exorbitant amounts for a simple analog pressure sensor? 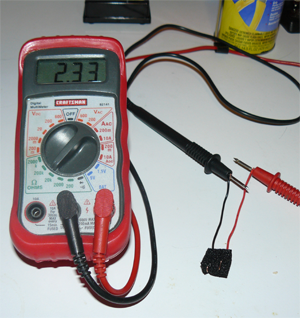 Well here is an easy smeasy way to make an incredibly cheap analog pressure sensor. This pressure sensor won’t be terribly accurate in terms of measuring precise weight or things of this nature, though it can be calibrated somewhat and if you choose to coat it in something like Plasti Dip some of the variables such as humidity and the like can be minimized. However, what this analog pressure sensor is best for is for creating things like bumper sensors that can read variable levels of pressure and various other touch / pressure sensor applications. My preferred method of covering the sensor is to use Plasti Dip or equivalent liquid plastic coating. 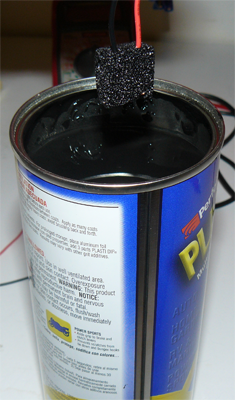 If using Plasti Dip, dip once slowly and hang the sensor to dry. Wait 20 minutes and do this again. That should give a nice thick coat on the sensor. The Plasti Dip will stiffen the sensor quite a bit, so don’t put too much on if you want it to stay extra squishy. In this case, one coat is probably enough. Play with it to get it to your liking for your particular usage. I’ve also tried using a little bit of visqueen cut and wrapped over the pressure sensor and sealed around it. This worked pretty well. And of course, you could just not put any covering on it at all if you aren’t worried about electric shock in the usage you are using these for. I wish I could remember where I learned this. I picked it up in an electrical engineering textbook I read a few years back when I got really in to learning electrical engineering. But, I can’t remember what textbook it was in and can’t seem to find a reference anywhere to this handy little trick for making a cheap analog pressure sensor. If anybody knows an electrical engineering book that mentions making an analog pressure sensor this way, please let me know so I can cite it here. Nice article Daven. I don’t know if Gordon McComb’s book, “The Robot Builder’s Bonanza” is what you’re thinking of, but that’s where I first came across the idea of using conductive foam as a pressure sensor. This was in a slightly different form, using a mylar sheet – conductive foil – conductive foam – conductive foil – mylar sheet sandwich. No Plasti Dip coating, though he does suggest encasing the assembly in heat-shrink tubing. Do you think this could be used in a matrix circuit design? Say you had 4 wires running the length and 4 wires running the width of the foam. The objective being to select individual or multiple contacts. Would this be a suitable way for such an array of switch contacts? Epic hack boss just what I needed for my next prank, mu ha ha ha. Anybody tried using this type of sensor as a depth sensor(water level) for a tank? That is super awesome idea! I will use it in my projects as well. I will feature this page in my site. Excellent. any one can plz tell me how one can make a pressure sensor of human foot size. anyone ever try this as a depth sensor on a submersible robot? I was thinking of making one and putting it inside a super flexible water tight enclosure so the deeper you go (hopefully) the more it is compressed and the resistance changes. the program would read that and then adjust depth via a homemade swim bladder. If it works it would be WAAYYYY cheaper than a submersible pressure transducer. hey, how much can this pressure sensor gauge??? please reply asap thanks!! @izzah: Depends on how stiff you make it. The sensor itself can do a pretty wide range, but in it’s foam form gets pressed completely with very little force obviously. If you coat it in something like the plastic dip, depending on how much you coat it, it will be a lot harder to squish it completley, so be able to register higher pressure. In the extreme case, you could even create a contraption with springs and plates and the like with the foam in between to potentially register extremely high pressures. What kind of wire do I use? Any? Would something like a cupcake be too light? @Sam: any wire will do. I tend to use solid core for these, just because it bends pretty solidly at the end to help hold it firmly in place in the foam, but really stranded wire would work just fine as well. I’m not quite sure if something like a cupcake would register strong enough with this, particularly if unfrosted ;-). I imagine it would depend on the surface area of the sensor. If it was large so that the cupcake’s weight was more highly distributed, I’d guess not. However, if you made a small sensor, I imagine that would work, but certainly this type of sensor works better with things with a bit more force than the weight of a cupcake. 🙂 Something to play around with though. Forgot to say please and thank you. Everything was going well until I applied the Plasti-Dip. After it dried, the sensor no longer worked. I tried this a couple of times to no avail. Oddly, I couldn’t get a resistance out of the sensor even after i cut it in half and inserted new leads into the foam. What happened to the foam? @Regz: How bizarre! 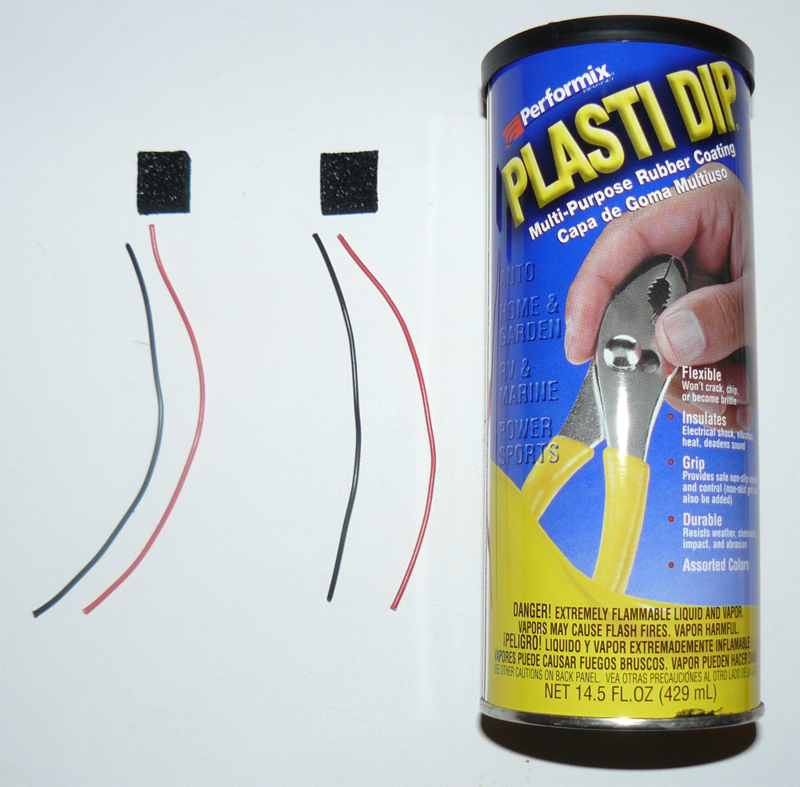 I’ve done it numerous times with the plasti-dip and without and never had that problem. No idea what might have caused it… maybe the foam you were using was super porous and let the plasti-dip soak in deeply??? Probably not, but I can’t think of anything else. @Daven: I know, right? That’s the only thing I can think of as well. I wanted to use this method to replace a couple of broken Interlink FSRs on a project I am working on. I may still use ’em, just without coating. It only needs to function for a few days anyway. @Daven: So, just for the heck of it I tried my sensor again almost 24 hours later and low and behold, it works. I guess I just didn’t give the Plasti-Dip enough time to settle. 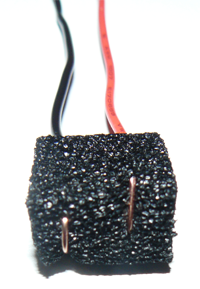 How much voltage can a 10 cm3 of conductive foam can produce?? Thank you ! this is great/just what is need!! 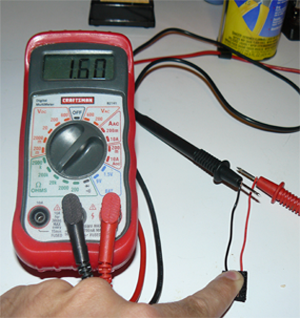 what setting should my multimeter be on to test the pressure? Thanks for the starting point. My son and I have built, modified and tested sensors based on this design and incorporated them into a Sea Perch home-made submersible. We have hooked it up to a micro-controller to enable it to go to, and maintain depth autonomously. We did change the design a little as we found the wires electrical contact was unreliable, so we sandwiched the foam between two small pieces of etching board. We also found the Plastidip went off over time and hardened, so we used heat shrink and hot melt glue to waterproof the sensors. So far it is all working well. Results will be posted on seaperchaustralia.org soon.